Abstract: These days, if you want a top of the line system, it's going to have a Pentium 4 inside. The Intel Pentium 4 processor has come a long way in the last two years. These days, if you want a top of the line system, it's going to have a Pentium 4 inside. Yes, AMD's AthlonXP 2700+ and 2800+ processors are just as powerful, its just that they're almost impossible to find for retail sale while the P4 2.8 GHz has been easily available since its' introduction. 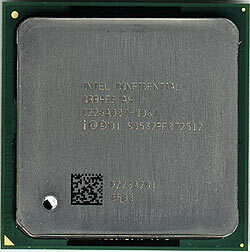 Ever since the Northwood core was been introduced, Intel has been in front in terms of performance, and perhaps more importantly, availability. What makes the Intel Northwood P4 so attractive is that Intel has doubled the size of the L2 cache. With 512KB of L2 cache the performance penalty for having a long CPU pipeline has been dramatically reduced. To top things off, Northwood Pentium 4's are great overclockers. Many 1.6A and 1.8A P4's have no problem hitting 2.4 GHz+ with retail cooling! So what's new with the P4 2.8 GHz processor other then clock speed? The CPU is based on the new C1 core which uses the new enhanced, shrunken, Northwood core which has a surface area of only 131 mm2. Non-enhanced B0 steeping Northwoods are 145mm2 in size. C1 stepping Northwood P4's also run on a higher voltage of 1.525V as opposed to 1.5V for the B0 based Northwood's. Looking at the bottom of the processor we see that Intel is using larger resistors. Using the retail cooler (temperatures never exceeded 50 degrees celsius during testing) we began to up the FSB slowly. Unfortunately I hit the wall at 147 MHz FSB which only gives us 3.09 GHz while using 1.6V. No matter what voltage I gave the CPU, I couldn't go above that mark. I think the limitation may be due to other hardware; namely the PSU. Unfortunately we recently had to swap out the trusty Antec 400W PSU for a 300W version recently. Using Antec's 300W PSU I've been noticing problems overclocking previously tested components to the same level as tested before.